ERNIE McCloy put the Lisburn District Dart League on the map in June, 1966 when g he won the North of Ireland Individual Championship at F. the BCT rooms in Belfast. Another local thrower Ernie Coard reached the semi-finals. End of an era as building is demolished. IT was the end of an era in June 1999 when demolition began on St. Joseph's Hall at Chapel t Hill. The well known landmark had existed for 110 years but before the building was knocked down the carved stone statue of St. Joseph was carefully re- moved. The building had been constructed in 1889 and had been a place of education for many young boys and girls in the area. 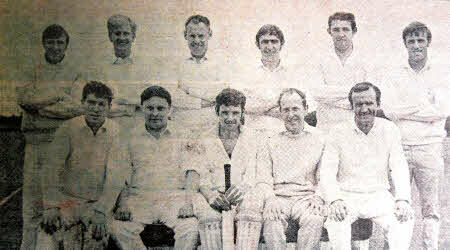 The members of Lambeg Seconds Cricket team before a game in 1966. NEWS that a young local teenager may be signing for an English League football team was causing excitement in June 1966. The Star reported 17-year old Roy McCaugherty from Hillsborough had been approached by Oldham Athletic. Roy, who lived at Dunbog Park said at the time he was interviewed: "I will have to have further talks with the officials and the club I now play for. I would also have to consider giving up my job." Roy was employed by Hillsborough Agricultural Research Institute. His football career began as a schoolboy at Lisnagarvey Intermediate School and after leaving school he played for Bibbys in the Lisburn League. He was then signed by Glentoran and played for their third team Parkgate Olympic. "My mother and father are not too keen on me crossing the water, but if things look bright I think I'd give it a try," added Roy. MAYFIELDS and Kirkwoods Road residents were up in arms in June, 1999 over plans by the army to build 130 new homes in their area. The Star reported that almost 200 local people and public representatives had attended a meeting to voice their opposition to the scheme. A planning application had been had been submitted to the DOE planners seeking approval for the houses on land at Magheralave Road and Kirkwoods Road. Neighbourhood notification of the proposal was sent to residents living closest to the proposed new development at Kirkwoods Park, Mayfields and Marnabrae. Among those at the meeting was Lagan Valley MP Jeffrey Donaldson and members of Lisburn Borough Council. A spokesman for the group against the plans said: "This significant development of military housing will dramatically change the existing character of what is an established neighbourhood. "It will also result in a 250% increase in density of housing the area. As this is a private finance initiative it is intended to lease all these properties to the MoD for military housing. Therefore all the proposed - dwellings will become rented accommodation which is in marked contrast to the existing properties." 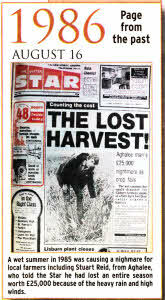 A wet summer in 1985 was causing a nightmare for local farmers including Stuart Reid, from Aghalee, who told the Star he had lost an entire season worth £25,000 because of the heavy rain and high winds. 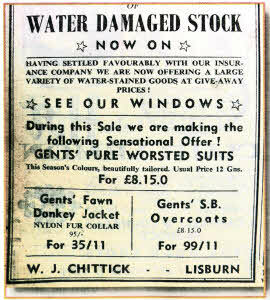 There was a chance of a real bargain in 1958 when WJ Chittick of Lisburn were selling water stained goods. BEFORE the dogs were racing at BalIyskeagh it was the horses. Back in June 1969 the Star reported on a growing interest in the horse trotting held at. the Lambeg stadium. The lands were origin owned by Samuel Smyth but bought by a syndicate. There were plans to develop the site and hopefully attract people to the meetings. Several races had been held at the Lambeg stadium which saw, a good level of interest and entries for the various events. Given time, the syndicate hoped to create an even bigger awareness in the sport which was huge in America at the time. IN June 1966 the Star reported the Grundig plant based at Derriaghy which made tape recorders had to pay off around 160 workers. It was because of a shipping strike which was gradually crippling Ulster industries and the company said that many more of the 1,000 workforce would have to go before the end of the month if the strike continued. A spokesman for Grundig said the action had to be taken because of a run down of sheet metal and imported parts.